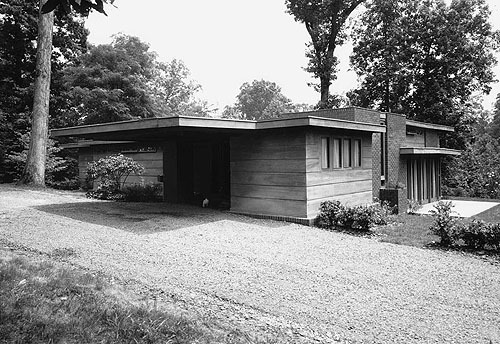 In August 1939, Loren B. Pope, a journalist working for the Washington Evening Star, Wrote to Frank Lloyd Wright and asked if he would design a home for his property in Falls Church, Virginia. Two weeks later Mr. Wright responded, "Of Course I am ready to give you a house. We are expecting to see you soon..."
In a 2006 interview, Pope recalled, "In January 1938, a Time magazine article again sparked my interest in Wright and his recently published An Autobiography. I borrowed the book from the library, returned it the next day, bought my own copy and soaked up every chapter two and three times before going on to the next." National Building Museum, Reiss, 2006. By October 1939, the preliminary sketches were ready, and Pope traveled to Taliesin to view them. He attempted to secure a loan, but every lending agency refused. He quoted one lender, "Loren, this house would be a white elephant." He finally secured a loan from his employer, the Washington Evening Star. Construction began in May 1940, with Taliesin apprentice Gordon Chadwick overseeing the project. Construction was completed during the early part of 1941, and the Popes moved into their new Wright designed home. They lived there for over five years until they put the home up for sale in November 1947. It sold within two weeks, and Mr. and Mrs. Robert A. Leighey moved into the home in February 1947. 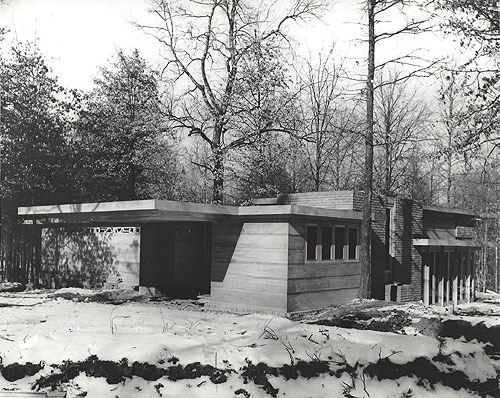 Like many of Wright's Usonian homes, it was an "L" shaped design based on a 2x4 foot rectangular module. It was constructed of brick, cypress and glass. Mr. Leighey past away in July 1963. In December of the same year, the Virginia Highway Department notified Mrs. Leighey that her home was to be condemned for a highway right-of-way in Falls Church, Fairfax County. In July 1964, she signed an agreement with the National Trust to save the home. Dismantling of the home began in the fall of 1964, reconstruction was completed in June 1965. She resumed residency of the home in July 1969. Three decades later, the home was moved again. Structural problems began to create cracks due to the unstable soil under the home. In 1996, the home was moved 30 feet away, where it sits today. 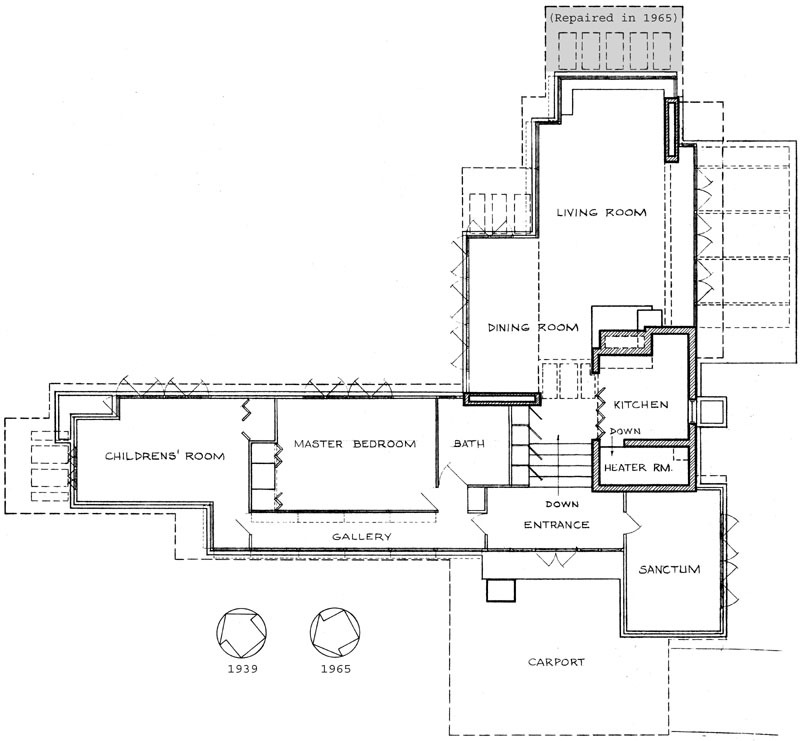 Floor plan for the Pope-Leighey House, 1939/1965. Frank Lloyd Wright designed this house, which was built in 1940 for Loren B. Pope. Mr. And Mrs. Robert A. Leighey purchased the home in 1946. In December 1963 Mrs. Leighey was notified that her home was in danger of demolition for a highway right-of-way in Falls Church, Fairfax County. In July 1964, she signed an agreement with the National Trust to save the home. 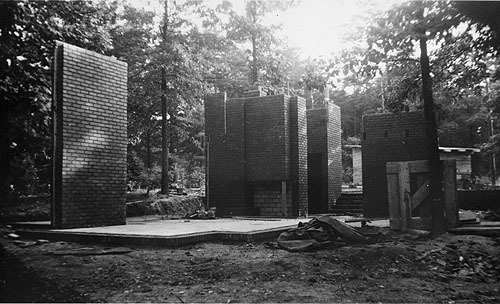 Dismantling of the home began in the fall of 1964, reconstruction was completed in June 1965. She resumed residency of the home in July 1969. Courtesy of The Library of Congress, adapted by Douglas M. Steiner. Loren B. Pope Perforated Light Screen, provide privacy and allow natural light to flood the interior. Loren B. Pope Perforated Light Screen, adapted by Douglas M. Steiner. Half panel Living Room Perforated Light Screen, adapted by Douglas M. Steiner. 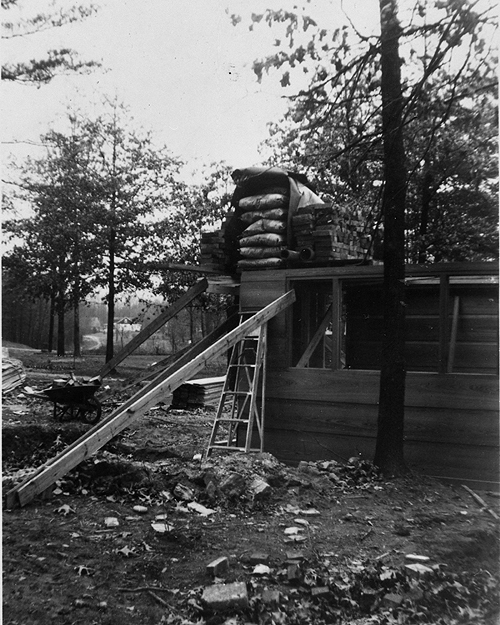 This set of seven photographs of the Pope-Leighey House were taken during construction by Loren Pope in 1940. Preliminary sketches were completed in October 1939. 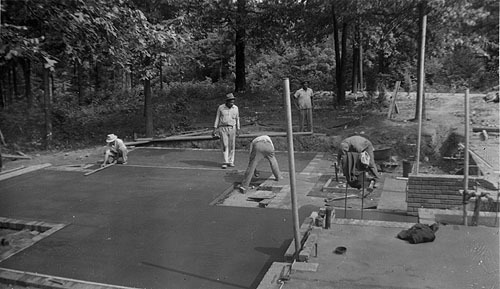 Construction began in May 1940, with Taliesin apprentice Gordon Chadwick overseeing the project. The house was completed during the early part of 1941. After the footings were poured, a row of bricks was laid around the edge. 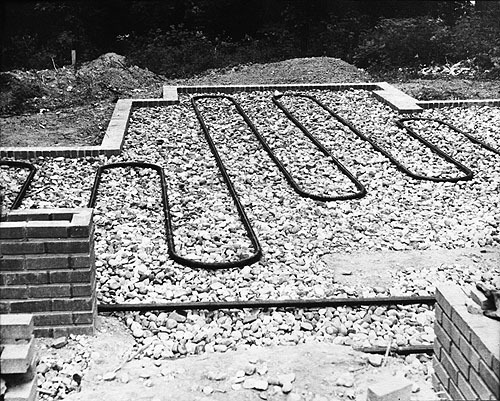 Two-inch iron pipe coils for the radiant heat were placed on a bed of crushed rock, and embedded in the concrete slab. "Radiant heating was a virtually unknown thing at that time. Everybody thought we were crazy to lay wrought iron pipes under the floor. They kept asking, �What if there is a leak? You would have to dig up the whole slab.' However, all the pipes were tested for almost a week at approximately 120 pounds of pressure. The normal operating pressure of the system is only 11 pounds..." Gordon Chadwick, apprentice assigned to the construction of the Pope house. 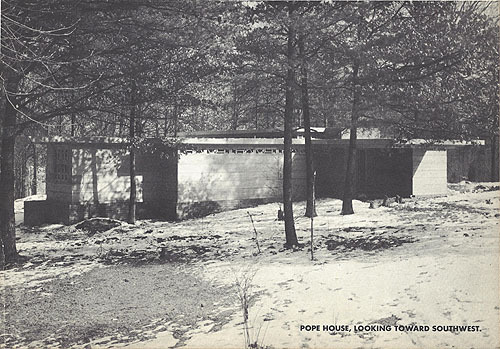 The Pope-Leighey House, Morton, 1969, p.75. Once the concrete pad was poured, a 2 x 4 foot grid was scribed in the concrete. Inspectors would not approve Wright's innovative sandwich wall, so they set up a test. 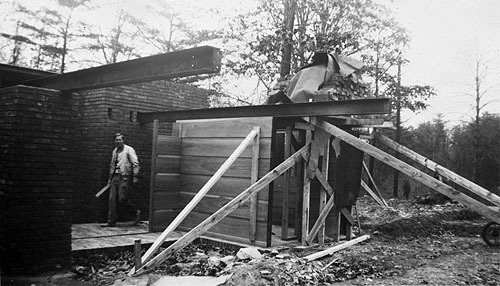 "The experiment was conducted in Falls Church before attempting to convince the building inspectors in Baltimore, where the Joseph Euchtman House was also under construction, that the innovative sandwich wall without struts could bear the required load." P.78. The Popes moved into the home during the early part of 1941. All photographs by Loren Pope. Courtesy of the William Edmund Barrett collection. 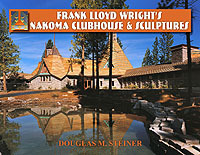 Frank Lloyd Wright published The Natural House, Horizon Press, in 1954. He included four drawings and photographs. 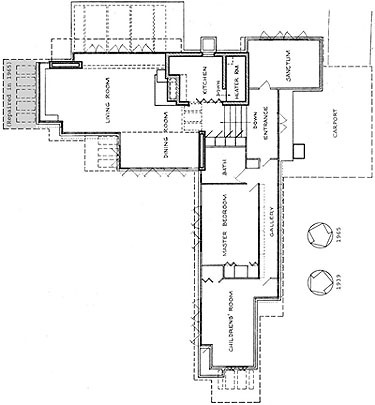 The estimates to build Wright's preliminary drawings shown here, were to expensive on Pope's salary of $50 per week, so Wright redesigned and reduced he size of the home. The average cost of a new house in 1940 was $3,920. 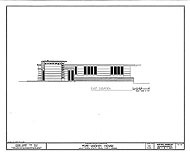 Initial estimates for Pope came in at $12,000, new estimates for the revised plan was reduced to $7,000, 1,800 to 1,200 square feet. 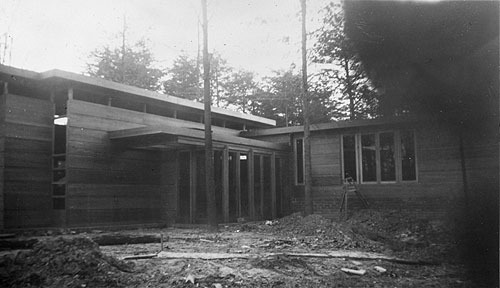 Wright published the price of $8,000 in The Natural House. 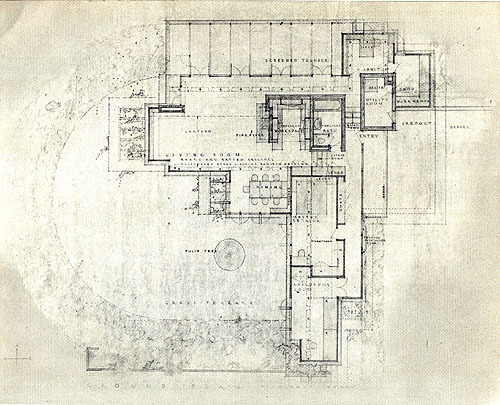 In Wright's preliminary sketch of the Loren B. Pope House, he included a "Lantern" above the Master and a portion of the Children's Rooms which included clerestory Perforated Light Screens. To the left of the bedroom wing the "Grass Terrace" was enclosed by a thick hemicycle row of foliage. The original entry was a single door, hidden under the Carport, tucked next to the Utility Room and Shop. The Shop was also eliminated. The screened Terrace, was also reduced. 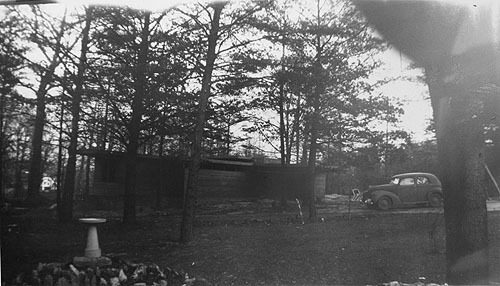 Although the two photographs were published in 1954, the landscape appears closer to the landscape in the 1940 #6 image. Landscaping appears incomplete, and there are stumps next to the Carport. The built-in planter on the left appears to be empty. The screened Terrace has yet to be screened. Construction began in May 1940, the Pope's moved into the early part of 1941. Possibly photographed during a late snowfall in March-April 1941 or during the winter of 1941-42. 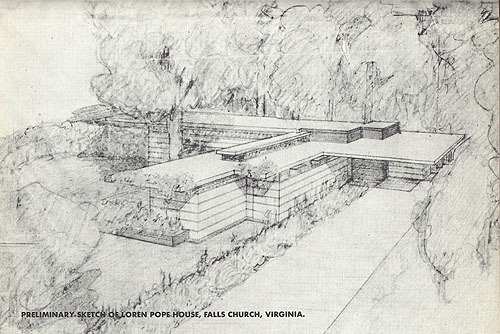 1) Preliminary sketch of the Loren B. Pope House, Falls Church, Virginia. In the center foreground, this original sketch included a "Lantern" above the Master and a portion of the Children's Rooms which included clerestory Perforated Light Screens, allowing additional light and ventilation into the rooms. To the left of the bedroom wing the "Grass Terrace" was enclosed by a thick hemicycle row of foliage. The original entry was a single door, hidden under the Carport, tucked next to the Utility Room and Shop. The Shop was also eliminated. The screened Terrace, was also reduced. Courtesy of The Natural House, Horizon Press, 1954. 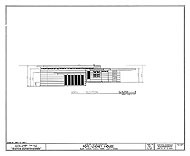 2) Loren B. Pope Preliminary Floor Plan. Courtesy of The Natural House, Horizon Press, 1954. Revised and reduced Floor Plan for the Pope House. It was reduced from the initial square footage of 1,800 to 1,200 square feet. Note: we have reduced and rotated the floor plan so it can be compared to the original Preliminary Floor Plan. 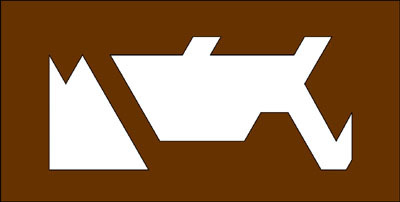 Adapted by Douglas M. Steiner. 3) Viewed from the Southwest, circa 1941. Although published in 1954, the landscape appears closer to the landscape in the 1940 #6 image. Landscaping appears incomplete, and there are stumps next to the Carport. The built-in planter on the left appears to be empty. Construction began in May 1940, the Pope's moved into the early part of 1941. Possibly photographed during a late snowfall in March-April 1941 or during the winter of 1941-42. The two bedrooms are in the foreground wing on the left. The row of Perforated Light Screen windows that run the length of the Gallery, allow light in and also a measure of privacy. The Entrance, Carport and Office are to the right. Courtesy of The Natural House, Horizon Press, 1954. Possibly photographed by Hedrich-Blessing. 4) Viewed from the South, circa 1941. Although published in The Natural House, 1954, it appears to be photographed at the time as the image above (#3). Possibly photographed during a late snowfall in March-April 1941 or during the winter of 1941-42. The built-in planter on the right, just outside the Kitchen window appears to be empty. The screened Terrace on the right has yet to be screened. Construction began in May 1940, the Pope's moved into the early part of 1941. 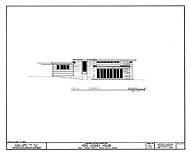 The two Bedrooms are on the left, the Carport and Entrance in the center, Office, Kitchen and Living Room are on the right. Photographed by Hedrich-Blessing. Courtesy Douglas M. Steiner. 4A) Detail of the Southwest elevation. The two Bedrooms are on the left, the Carport and Entrance in the center, the Office is on the right. 4B) Detail of the Southeast elevation. The built-in planter just outside the Kitchen window appears to be empty. The screened Terrace on the right has yet to be screened. Set of nine drawings of the Pope-Leighey House by the National Park Service for the Historic American Building Survey (HABS) 1964. Frank Lloyd Wright designed this house, which was built in 1940 for Loren B. Pope. 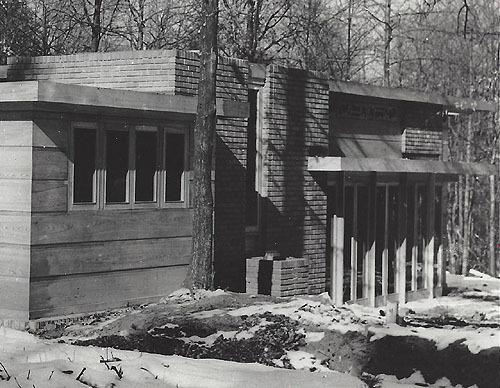 An example of Wright's "Usonian House," the structure, in danger of demolition in 1965 for a highway right-of-way in Falls Church, Fairfax County, was saved, moved and restored by Mrs. Robert A. Leighey, The National Trust for Historic Preservation and The National Park Service. This important American Architectural Monument was relocated at Woodlawn Plantation, near Mount Vernon. All drawings courtesy of The Library of Congress. Pope-Leighey House Circa 1970, viewed from the West. There are a few details that place this photograph close to the 1969 images, but at a later date. Damage to the fascia , about 2-3 feet from the Western corner is consistent with 1969. The screened Terrace is missing the screen, as is evident in 1969, #6. Details that place it at a little later date: mature plants, oil stains on the drive and the mail box. These and the cat at the entrance would indicate that Mrs. Leighey is now living in the home. Also in the Chadwick interview published in 1969, he says "I also feel that the screened porch and terrace must be rebuilt." P.75. 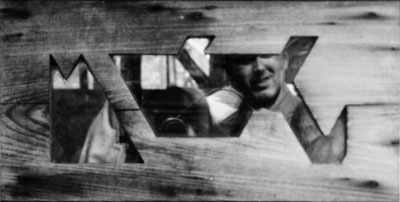 It is interesting to note that although Wright�s original plans included the design for the screen, it had not been built when it was published in The Natural House, 1954. Courtesy of the State of Virginia. In April, 2006 on a trip to Washington D. C. with our oldest grandson, we had the opportunity to visit the Pope-Leighey House. The house has rotated about 45 degrees during the 1965 reconstruction, so where the entrance faced Southwest in 1939, it now faces Northwest. But I assume that had to do with typography rather than lighting. Ten years before our visit, the home was moved again. Structural problems began to create cracks due to the unstable soil under the home. In 1996, the home was moved 30 feet away, where it sits today. As you approach the home from the same direction as in 1939, the Carport, it has been positioned on a slope much like the original. Like many of Wright's designs, the entrance is hidden, and is not revealed until you reach the home. So you take a step of faith, not knowing where, but knowing it is there. On April 7, 2015 nine years to the day, we had the opportunity to visit the Pope-Leighey Residence for the second time, on a trip to Washington D. C. with our granddaughter. The house has rotated about 45 degrees during the 1965 reconstruction, so where the entrance faced Southwest in 1939, it now faces Northwest. 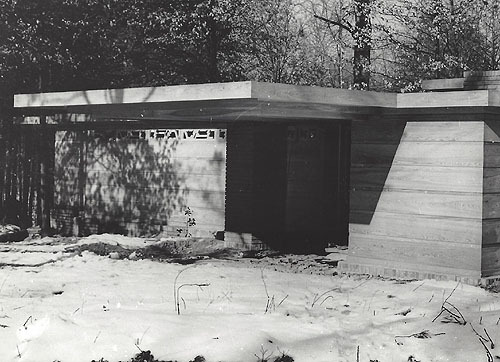 Like many of Wright's Usonian homes, it was an "L" shaped design based on a 2x4 foot rectangular module. It was constructed of brick, cypress and glass. Nineteen years before this visit, the home was moved again. Structural problems began to create cracks due to the unstable soil under the home. In 1996, the home was moved 30 feet away, where it sits today. Third time is a charm. The home is situated on the Woodlawn Plantation in Mount Vernon, but so seclude in the woods that the four-lane road, only 300 feet away, is hidden from view. The colors of the unfinished cypress and bricks blends with the surroundings. Like other Usonians, the homes are built on a slap, have a flat roofs and built-in planters. The slab which the home is built on is bordered in bricks. "House Beautiful", August 1948, pp. 32-34, 80, 90. "The Natural House", Wright, 1954, pp 143-146. "The Pope-Leighey House", Bullock and Morton, 1969. "The Decorative Designs of Frank Lloyd Wright", Hanks, 1979, pp. 156-160. "Frank Lloyd Wright Monograph 1937-1941", Vol. 6, Text: Pfeiffer; Edited and Photographed: Futagawa, 1990, pp 162-169. "Frank Lloyd Wright Remembered", Meehan, 1991, pp.65-75, 140-47. "Frank Lloyd Wright Selected Houses 6", Pfeiffer, 1991, pp.78-91. "Architectural Monographs No 18: Frank Lloyd Wright", Heinz, 1992, p.102-103. "The Frank Lloyd Wright Companion", Storrer, 1993, p 276. "Frank Lloyd Wright, East", Heinz, 1994, pp.38-43. 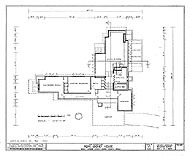 "Usonian Houses: Frank Lloyd Wright At A Glance", Ehrlich, 2002, pp.4, 6, 8-9, 40, 48-53.